The band have made "In a Dream" available for free download, and another track, the mellow, acoustic "Slipping," can be previewed on their MySpace page. 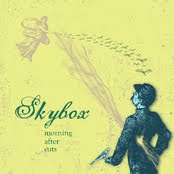 Morning After Cuts follows-up the 2006 Skybox debut, Arco Iris (reviewed here). Help support the local Chicago music community! Check out http://www.chicago.com/music/ On Nov. 22nd chicago.com/music will be hosting a public networking event at La Salle Power Co. this event will feature twelve local talents you won’t want to miss!